Tyrone manager Mickey Harte praises his team after a 3-10 to 1-8 victory over Armagh in Wednesday night's McKenna Cup semi-final. Goals from PJ Lavery, Shay McGuigan and captain Sean Cavanagh helped the holders to a comfortable win at the Athletic Grounds. 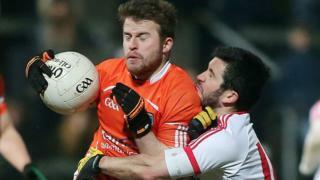 Tyrone will secures a fourth straight McKenna Cup triumph if they overcome Cavan in Saturday's decider.